"From the moment he stepped onto the stage in a white tuxedo jacket, it was clear he was not messing around," writes Mary McNamara at the Los Angeles Times. The show ended up being "revolutionary" in one sense, she adds, because it "nakedly and unapologetically" tried "to do something other than hand out a bunch of gold statues." Rock was picked before the "Oscars so white" controversy erupted, and James Poniewozik at the New York Times thinks it was a lucky coincidence. Not all the jokes worked, but enough did. "His performance was an example of something the industry is still trying to learn: that you can achieve both inclusion and entertainment by giving the right person just the right opportunity," he writes. "All too often, a host disappears from the Oscars ceremony after their monologue is done," writes Daniel D'Addario at Time. "This year's ceremony, though, was defined more by its host than by any of the winners. It was better for it." 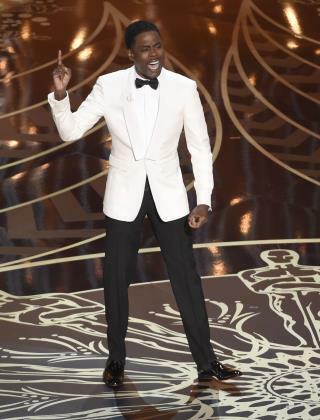 And echoing a previous sentiment: "He was exactly the host the Oscars needed in a tenuous moment." "Rock's scathing and generally well-crafted monologue at Sunday's Academy Awards recalled the episode of Black-ish that aired on the same network just a few days ago," writes Maureen Ryan at Variety. "Rock's opening minutes were entertaining, but they made an array of serious points." But at the New York Daily News, Shaun King thinks Rock's joke that African-Americans in the 1960s "were too busy being raped and lynched" to care about the Oscars was horrible. Rock "somehow found a way to simultaneously oversimplify what it meant to be black in the Civil Rights Movement while also drastically downplaying the size and scope of the injustice we face today," King notes. Non-Caucasians are not being cast in movies. How can they be nominated for awards? Yes, so revolutionary the ratings stunk. Victim hood by blacks will be taking a back seat to real problems for a few years. The country is tired and turned off by it.